In Verdi’s “Rigoletto,” Gilda (Uzbeki coloratura soprano Albina Shagimuratova) is tragically in love with the Duke of Mantua (Mexican tenor Arturo Chacón-Cruz). Cory Weaver Photo (cropped). There’s always something magical about opening of San Francisco Opera’s fall season. I wasn’t there for Friday’s festive gala celebration but I was there Saturday evening for Verdi’s Rigoletto sung by the alternate cast—Italian baritone Marco Vratogna as Rigoletto; Uzbeki soprano Albina Shagimuratova as Gilda and Mexican tenor Arturo Chacón-Cruz as the Duke of Mantua—with SF Opera’s Verdi demon, Nicola Luisotti, conducting. The performance, sans the partying, was wonderful, opening what promises to be a very interesting and musically diverse fall season for SF Opera. Given that 2013 is the bicentennial of Verdi’s birth and opera companies the world over are mounting Verdi productions, the popular opera, under Harry Silverstein’s direction, is the perfect season opener for SF Opera. Rigoletto will be performed 12 times, with two distinct casts of world-class lead singers to accommodate its compressed scheduling. SF Opera Music Director Nicola Luisotti will conduct all but the September 25th and 30th performances which will be handled by Giuseppe Finzi. (Serbian baritone Željko Lucic (Rigoletto), Polish soprano Aleksandra Kurzak (Gilda) and Italian tenor Francesco Demuro (Duke of Mantua) led off on Friday evening to favorable reviews.) I’ll be reviewing both casts. Saturday evening’s singing got better and better as evening progressed, especially from coloratura soprano Albina Shagimuratova who is back after her mesmerizing bravura debut this at SF Opera as the Queen of the Night in The Magic Flute. In June, the house loved her and got so excited after her lively Act 2, Scene 3 aria (“Der Hölle Rache kocht in meinem Herzen” (“Hell’s vengeance boils in my heart”) they gave her a roaring and prolonged standing ovation. Saturday was no different; her Act I, Scene 2 duet “Addio Addio” (“Farewell, farewell”) was a little tight. When she got to the beloved recitativo and aria, “Gaultier Maldé!…Caro nome, ” she sung on her back, confidently flaunting her powerful voice. By Act 2, when it came time for her “Tutte le feste al tempio” (“On All the Blessed Days”) I floated. By Act 3’s famous quartet, “Bella figlia dell’amore” (“Beautiful daughter of love”), she was unstoppable, lyrically melding with the other singers in a stunningly beautiful display of everything that opera should be. While Russians don’t have a monopoly on suffering, they do it so well. Throughout, her acting was superb. The rich, deep, and immediately recognizable voice of bass Andrea Silvestrelli as Sparafucile—the cunning assassin who Rigoletto pays to murder the Duke of Mantua—was also a standout among Saturday’s strong cast. He’s performed the role in L.A., Chicago and Houston and seems a perfect fit. Silvestrelli was Hagen in SF Opera’s epic 2011 Ring Cycle Götterdämmerung and Fasolt, the overall-clad giant, in Das Rheingold. Italian baritone Marco Vratogna as Rigoletto and Mexican tenor Arturo Chacón-Cruz, a former Merola fellow, as the Duke of Mantua and mezzo soprano Kendall Gladen as Maddalena. rounded out the cast. Vratogna last sang as Amonasro in SF Opera’s 2010 Aida. His bold Act I, Scene 2 aria, “Pari siamo!” (“We Are Alike”), where he admits that his tongue is just as much as weapon as the Sparafucile’s dagger, was sung passionately. His fine acting skills drove home the character’s sorrow and torment in his dramatic Act II aria, “Cortigiani vil razza dannata” (“Accursed race of courtiers”). The handsome Mexican lyrical tenor Arturo Chacón-Cruz embodied the Duke of Mantua better than any tenor I’ve seen, playing the boastful and cavorting cad to the hilt. It helped that he’s a young 35, relatively buff, and exuded chemistry with both Gilda and Maddalena. His character sings some of opera’s best-known melodies too, so he’s tremendously important. His voice was particularly well-suited to the famous quartet, “Bella figlia dell’amore” (“Beautiful daughter of love”). Chacón-Cruz actually started out as a baritone (and bass) but became a toner after Plácido Domingo told him that he, too, started out as baritone and then switched to tenor. Rigoletto, 2012. San Francisco Opera Orchestra and Chorus conducted by Nicola Luisotti. 1) Arturo Chacón-Cruz as The Duke of Mantua; 2) Albina Shagimuratova as Gilda and Arturo Chacón-Cruz; 3) Marco Vratogna as Rigoletto; 4) Marco Vratogna and Albina Shagimuratova; 5) Albina Shagimuratova; and 6) Arturo Chacón-Cruz. Luisotti’s passionate conducting is a show in itself and Saturday was no exception. At the end of the opera, just as after Rigoletto and Gilda’s heartbreaking duet, as Rigoletto wails that the curse has come to pass, Luisotti dramatically raised his arms and boldly summoned the curse to descend. 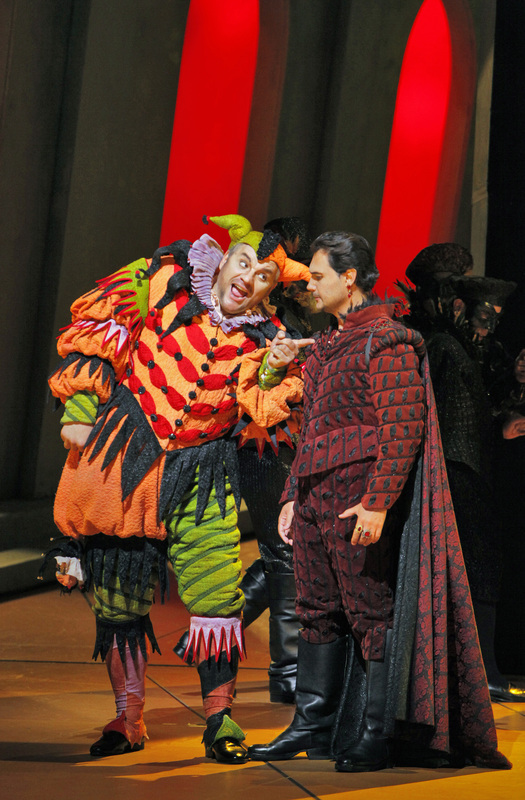 Italian baritone Marco Vratogna is Rigoletto and Mexican tenor Arturo Chacón-Cruz is The Duke of Mantua in Verdi’s “Rigoletto,” which opens San Francisco Opera’s fall season. Photo by Cory Weaver. People seem to have a love-hate relationship with Tony Award winning designer Michael Yeargan’s sets which evoke Italian painter Giorgio de Chirico in their boldly colored, deliberately skewed and disquieting scenes of 16th century Mantua’s streets, the Duke’s palace, Rigoletto’s house and Sparafucile’s inn. In fact, this is the fourth time that Yeargan’s sets have been used by SF Opera since 1997 for this production. It was my first time to see them but I found they made a profoundly metaphysical contribution to the opera. Chris Maravich’s beautiful lighting was certainly a factor. By contrast, Constance Hoffman’s predictable period costumes seemed to weigh it down. Approximate running time: 2 hours, 35 minutes, including one intermission. Details: War Memorial Opera House is located at 301 Van Ness Avenue, San Francisco. One of the last Beaux-Arts structures built in the United States, the Opera House seats 3,146, with 200 standing room places. Every performance features supertitles (English translations) projected above the stage, visible from every seat. Remaining Performances: Sept.11 (8 p.m.), Sept. 12 (7:30 p.m.), Sept. 15 (8 p.m.), Sept.16 (2 p.m.), Sept. 18 (8 p.m.), Sept. 19 (7:30 p.m.), Sept.21 (8 p.m.), Sept. 23 (2 p.m.), Sept. 25 (7:30 p.m.) and Sept. 30 (2 p.m.). Tickets: : $22 to $340 at the Box Office, 301 Van Ness Ave., San Francisco, by phone at (415) 864-3330, or online at www.sfopera.com. Standing Room tickets go on sale at 10 a.m. on the day of each performance; $10 each, cash only. The Sept. 15 performance will be simulcast in a free event at AT&T Park; go to www.sfopera.com/simulcast to register. San Francisco Opera opens its 90th season Friday with Verdi’s “Rigoletto” conducted by Nicola Luisotti. 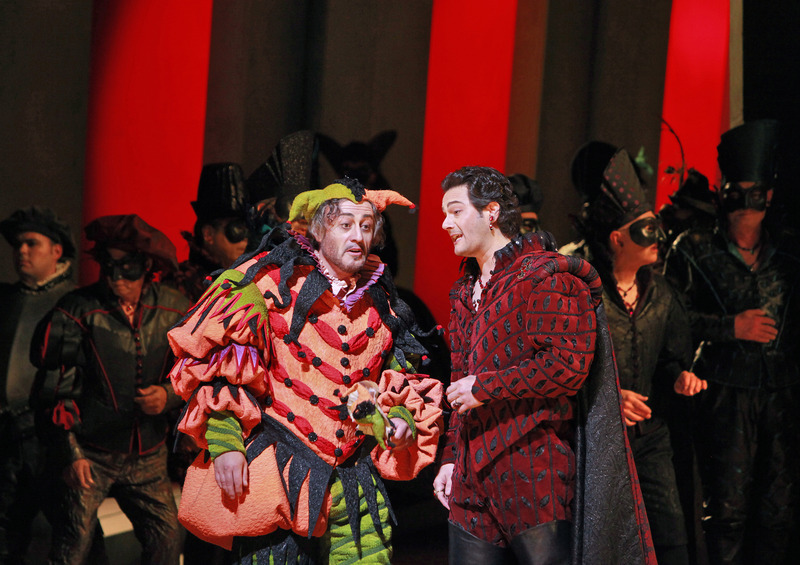 Željko Lučić (Rigoletto) and Francesco Demuro (The Duke of Mantua). Photo by Cory Weaver. San Francisco Opera opens its 90th season this evening with a gala celebration, an elegant ball and Verdi’s romantic opera Rigoletto, from 1851, which recounts the tale of the cursed and crippled jester, Rigoletto, who serves his master, the Duke of Matua, in seducing young women and unwittingly murders his own daughter Gilda, whom he has gone to great means to protect. San Francisco Opera’s charismatic Music Director Nicola Luisotti, a Verdi aficionado, will lead the orchestra while opera and theater director Harry Silverstein returns to direct this San Francisco Opera production with sets designed by Michael Yeargan. Rigoletto: An audience favorite for its captivating and heart-wrenching story and catchy music, Rigoletto will have 12 performances, alternating between two world-class casts and two conductors, Nicola Luisotti and Giuseppe Finzi. Serbian baritone Željko Lucic and Italian baritone Marco Vratogna alternate in role of Rigoletto; Polish soprano Aleksandra Kurzak and Russian soprano Albina Shagimuratova alternate as Gilda. Italian tenor Francesco Demuro and Mexican tenor Arturo Chacón-Cruz alternate as the Duke of Mantua. Lucic, Kurzak, and Demuro will lead off on Friday evening with Luisotti at the helm. Both casts also feature alumni of the prestigious Merola and Adler training programs. Opera Ball 2012, Notte di Splendore: A highlight of the City’s cultural and philanthropic season, Opera Ball is the Company’s celebrated signature fundraising event co-produced with San Francisco Opera Guild to benefit San Francisco Opera and San Francisco Opera Guild’s education and community programs. Honorary chairwomen are Cynthia Fry Gunn, Jeannik Méquet Littlefield, and Diane B. Wilsey. Notte di Splendore begins with an elegant pre-performance cocktail reception at 5 p.m. in the historic War Memorial House. A sumptuous dinner by acclaimed chef Lucas Schoemaker of McCall Associates follows in the tented Opera Ball Pavilion, transformed by renowned event architect Robert Fountain into an Italian palace fit for the Duke of Mantua. 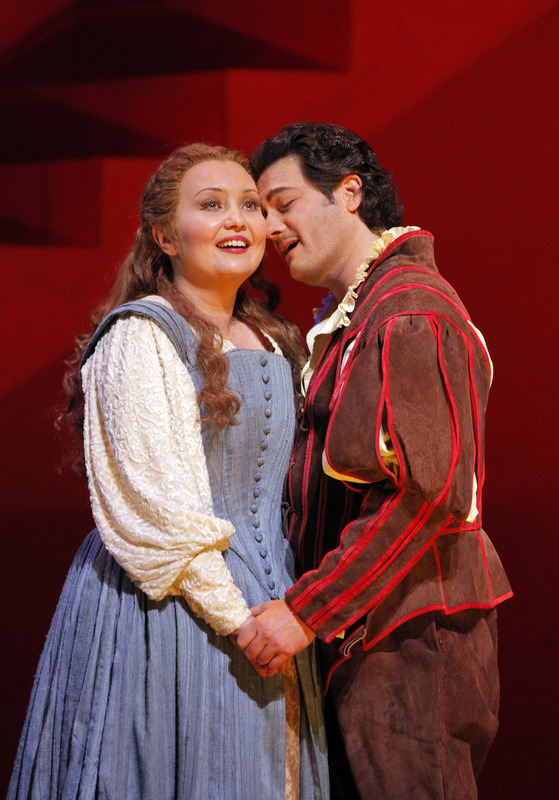 At 8 p.m., the curtain rises on the gala opening night performance of Rigoletto. Following the conclusion of the opera, Opera Ball patrons will return to the Opera Ball Pavilion for cocktails, desserts and dancing the night away to the Richard Olsen Orchestra. The event is entirely sold out. 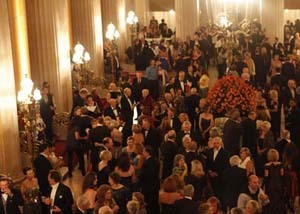 There’s nothing like opening night at San Francisco Opera. The Gala: The 21st annual BRAVO! CLUB Opening Night Gala starts at 6 p.m. this evening (Friday) with an elegant cocktail reception in the Grand Foyer of the Veterans Building followed by the 8 p.m. opening night performance of Verdi’s Rigoletto. The celebration includes a post-Performance Party, from 11 p.m. to 2 a.m., in the elegant Green Room of the Veterans Building where the festivities continue with dessert and dancing. More information here. 2012 Season and the San Francisco Opera Orchestra conducted by Nicola Luisotti. The concert draws thousands of music lovers each year, many of whom enjoy the occasion with elaborate picnics on the lawn. In the event’s time-honored finale, the audience joins with the singers in a rousing rendition of the drinking song (“Libiamo nei’lieti calici”) from Verdi’s La Traviata. This concert, held in Sharon Meadow at Golden Gate Park, is free and open to the public. Details: War Memorial Opera House is located at 301 Van Ness Avenue, San Francisco. One of the last Beaux-Arts structures built in the United States, the Opera House seats 3,146, with 200 standing room places. Every performance features supertitles (English translations) projected above the stage, visible from every seat. Performances: Sept. 7 (8 p.m.), Sept. 8 (8 p.m.), Sept.11 (8 p.m.), Sept. 12 (7:30 p.m.), Sept. 15 (8 p.m.), Sept.16 (2 p.m.), Sept. 18 (8 p.m.), Sept. 19 (7:30 p.m.), Sept.21 (8 p.m.), Sept. 23 (2 p.m.), Sept. 25 (7:30 p.m.) and Sept. 30 (2 p.m.). Tickets: : $22 to $340 at the Box Office, 301 Van Ness Ave., San Francisco, by phone at (415) 864-3330, or online at www.sfopera.com. Standing Room tickets go on sale at 10 a.m. on the day of each performance; $10 each, cash only.